Traditional Heirloom Clothing-Flower Girls Dresses, Ring Bearer Outfits, Heirloom Clothes for Portraits Paintings and Special Occasions. Our heirloom dresses and outfits use the finest cotton batiste and cotton blend fabrics as well as varied details such as French lace, hand embroidered Swiss inserts, entredeux, dainty pleats and pintucks and satin ribbon. 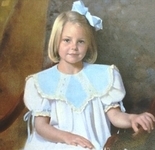 Heirloom garments, dresses and outfits are treasures to compliment the beauty of childhood. Their timeless and classic style create keepsake clothing pieces that will be enjoyed and handed down for generations.